The Bee’s Knees are a unique showcase of musical talent formed by accordionist, singer, and band leader Erica Marie Mancini. 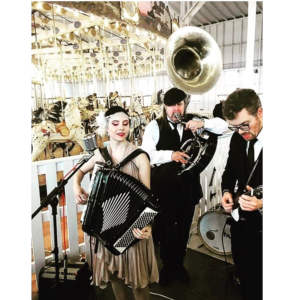 Drawing on inspiration from authentic Argentine Tango, Italian Ballads, Doo Wop and the Great American Songbook and Tin Pan Alley Hits, the band belts out songs both old and new with a salty and sultry kick. Instrumentation includes accordion, mandolin, electric guitar, banjolin, sax, bass sax, clarinet, slide trumpet, tuba, and percussion, and the group can be as small as a duo and as large as a 6 piece band. Though the repertoire launches from roots in American traditional jazz, The Bee’s Knees power in many directions, as their individual musical backgrounds are as diverse as New York City itself, stemming from Klezmer, blues, free improvisation, latin, funk, contemporary, classical and more.